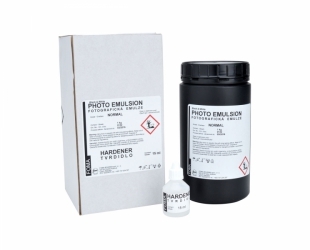 The Foma photographic emulsion is made by using the most modern production technology. The emulsion features medium contrast and extremely high covering power which enable gaining a wide scale of halftones even by a relative high yield of 3 to 6 sq. m per 1 kg of emulsion. An advantage of this high-speed emulsion are short exposures which make large size enlarging possible. With the majority of developers, this emulsion gives a neutral to mildly warm image tone. The emulsion can be spread on the most different bases including wood, textile, glass, china, ceramics, metals, leather, stone, concrete, plaster etc.